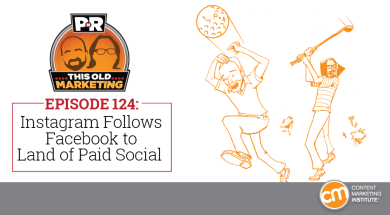 In this week’s episode of This Old Marketing, Robert and I discuss Instagram’s move to duplicate Facebook’s algorithm, which makes it abundantly clear that the photo-sharing channel will be “pay to play” for most brands. Still, we believe it will open up some fascinating opportunities for companies willing to experiment. We’re astounded by the growth in Scott Brinker’s 2016 Marketing Technology Landscape, which contains nearly double the number of companies it did in 2015. Finally, we can’t understand why media companies are so myopically focused on supporting journalism with only advertising when there are other ways to monetize. Rants and raves include the passing of legendary tech icon Andy Grove, Mattel’s remarkable reinvention, and Michael Eisner’s Disney. We wrap up the show with a This Old Marketing example of the week from WeWork Creator Magazine. The death of Instagram for brands (7:19): Earlier this week, Instagram updated its news-feed algorithm. Posts will no longer appear in chronological order and instead will be sorted “based on the likelihood that you’ll be interested in the content.” Instagram, which is owned by Facebook, will choose what to surface and when, reports TechCrunch. Robert predicts that Facebook will migrate both its Instant Articles (sponsored content) and Canvas (rich media ads) platforms to Instagram. He and I agree that this should provide some really interesting opportunities for brands to create unique content experiences. It should also help Facebook maintain its meteoric growth trajectory. The marketing tech landscape continues massive growth (15:17): The martech space continues to grow at an astounding rate. Scott Brinker just published his 2016 Marketing Technology Landscape, which contains nearly twice the number of marketing technology companies that it did in 2015. Robert and I expect to see a lot of attrition and merger activity in this space during the next year, and we explain why. Are we at a tipping point against ad-supported journalism? (24:24): In recent months, a growing chorus is questioning the ability of advertising alone, no matter how novel or innovative, to support quality journalism. I point out that despite massive changes in technology and content distribution, the business model of journalism doesn’t seem like it has evolved at all. It’s still overwhelmingly focused on advertising. Robert finds it very curious that journalists seem to be absolutely disgusted by the thought of any other types of monetization. Robert’s rant and rave: Robert is a bit peeved this week over the lack of business media coverage of the passing of Andy Grove, the former CEO of Intel who was an extraordinary leader and business strategist. If not for him, digital wouldn’t be as pervasive as it is today. Robert raves about a presentation by Mattel president and COO Richard Dixon at last week’s Adobe Summit about the way in which the 70-year-old toy company has reinvented itself to appeal to today’s children and parents. Joe’s rave: I just finished reading Disney War by James B. Stewart, which chronicles the rise and fall and resurrection of the iconic media company. The majority of the book is focused on the Eisner era at Disney, which began in 1984. It includes an amazing quote from him, which has to do with creating art, history, and making a statement versus making money. 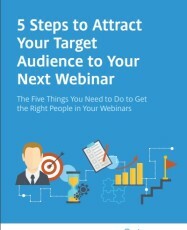 I’ve adapted it into a rallying cry for content marketing that was so inspiring, it gave Robert the chills. WeWork Creator Magazine: WeWork operates a network of coworking office spaces around the world but also views its mission as cultivating a community of creators. Its lifestyle magazine, Creator, tells the stories of the entrepreneurs who utilize its coworking spaces. The magazine was launched at the same time as the company in 2010, but initially wasn’t getting much traction. So WeWork relaunched it in 2013 as Creator. It now has 50,000 subscribers and is published weekly. The quality of the writing and photography is first-rate. 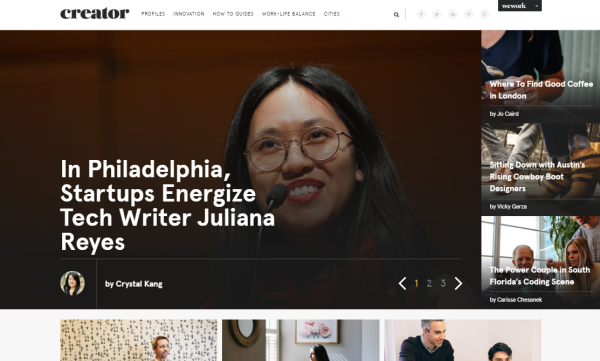 In addition to profiles, articles about innovation, how-to guides, and maintaining work-life balance, Creator also produces a special content series, including profiles of women who founded start-ups. It’s a very cool example of #This Old Marketing.